The Computer Headset Wire was cut by leg of chair when it was accidentally placed on top of wire. I was watching movies that were loaded on an external hard drive in my bed in the Hotel Las Palmas in Grand Bassam, Cote d'Ivoire, West Africa. Well I fell asleep with my headset connected to my ear, the computer was pulled off the chair. I discovered the computer headset wire was cut, only one of the two wires. Now, I often just pull the wire out of my ear and put on the floor until morning. Maybe the chair was moved onto the top of the wire and it was cut this way --- I am not sure. 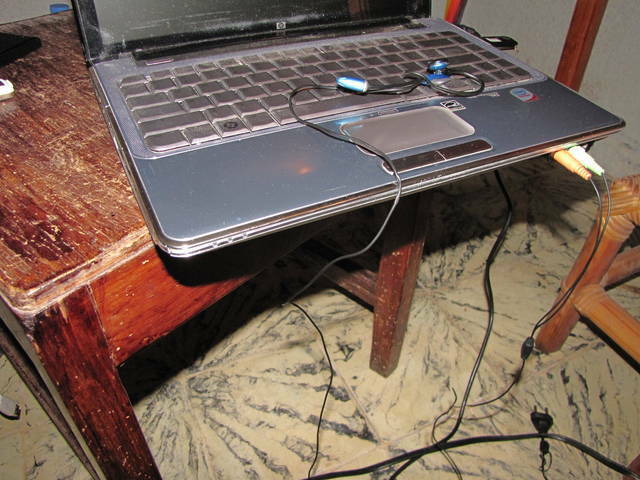 I know that rolling chairs in Internet cafés are good at cutting my computer cords. I was not able to repair the wire, it was some type of carbon or cloth like substance, maybe I can solder it and make it work, but normal twisting did not work.